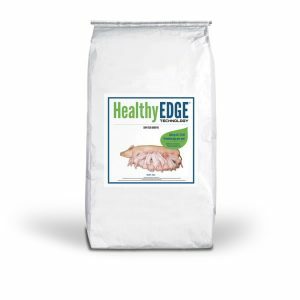 Healthy EDGE® Technology is a novel blend of functional ingredients formulated to support sows’ immunocompetence and litter performance. This unique technology is delivered in a flexible low inclusion of 1 lb. per ton of complete sow feed. Healthy EDGE® Technology have been designed to be fed continuously in gestation and lactation rations, to deliver up to 1.7 extra Full Value Pigs™ per sow per year. Additionally, it can be added to breeding and replacement gilt rations for optimum benefit.